Along with Shaker Hassan Al Saïd, Dia Al-Azzawi is regarded as one of Iraq’s most influential Modern artists, creating works that merge contemporary techniques with references to ancient traditions. A former archaeology student, Al-Azzawi grew up captivated by the artefacts of the Iraq Museum, which continued to hold an influence when he studied at Iraq’s Institute of Fine Art in 1964. In 1969, Al-Azzawi became a founding member of Iraq’s New Vision Group, its members united not by style, but by a desire to change an art scene they felt had grown rigid. Active during a period of political unrest, they created works that also reflected changes across the Arab world. Shaker Hassan Al Saïd was a founding member of the Baghdad Modern Art Group in 1951, its members championing art that drew upon the country’s heritage, or istilham al-turath. Al Saïd came to be recognised as a pioneer of Iraqi modern art, penning a manifesto that has been described as ‘the true birth of modern art in Iraq’ (Qatar’s Mathaf Museum). As a teacher, theorist and historian, Al Saïd was rooted in both past and present, his international outlook resulting in works that were a synthesis of Arab culture and European modernism. A brief period in France introduced the artist to works by Braque, Picasso and Klee, with the flat colour planes and bold contours of the post-Impressionist Cloissonism style also a visible influence in his work. In 1950, Saliba Douaihy left his native Lebanon for New York. Although his abstract works had gained recognition in his home country, New York’s dynamic art scene offered an energy Lebanon did not. Here, Modernist principles vied with a new mode of Abstract Expressionism, with artists including Mark Rothko, Hans Hoffman and Ad Reinhardt challenging approaches to form and colour. The move visibly shaped Douaihy’s output. After 10 years in New York, his earlier academic style had all but disappeared, to be replaced with a new mode of minimal abstraction. Working in series, the artist produced canvases depicting flat, monochromatic forms, their blocks of vibrant colour cut with fine lines and sharp edges. The style characterised his production until his death in 1994. Composed of brightly coloured, interlinking asymmetrical planes, the work Connection in this sale explores Douaihy’s principle of ‘infinite space’, in which paradoxically ‘flat’ colour appears to extend beyond the boundaries of the canvas edge. Although abstract, the work echoes Douaihy’s earlier realist landscapes — a reference, perhaps, to the enduring influence of his childhood home in the northern Lebanon Mountains. The son of Egypt’s Prime Minister, Mahmoud Saïd worked as a lawyer, prosecutor and judge. Although his successful legal career met with society’s approval, it denied a much stronger desire to make art. 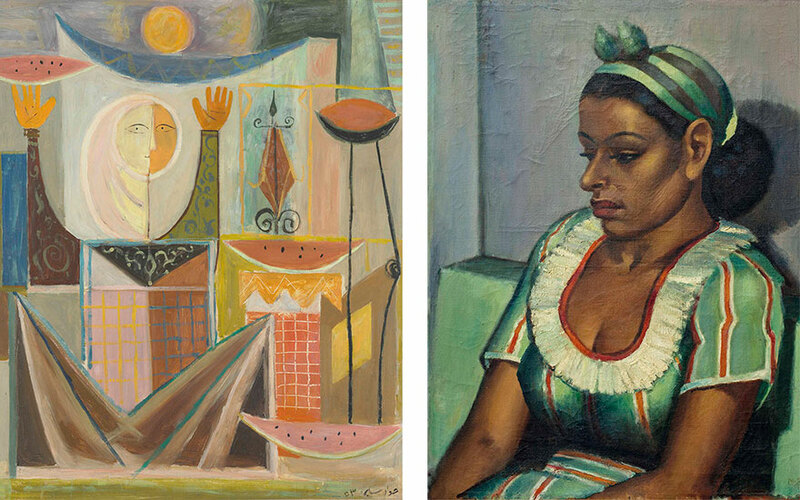 In 1947, at the age of 50, Saïd resigned from his legal career to become an artist full time. Saïd’s oil paintings employ Western techniques to capture his native Egypt, depicting scenes of contemporary life that reference the country’s long history. His subjects include veiled, statuesque women filling water jars at the edge of ancient temples, men in turbans drawing water from wells, dances and scenes of Islamic ritual. Iranian artist Monir Farmanfarmaian lived and worked in New York from 1945-57, meeting artists including Milton Avery, Willem de Kooning, and Joan Mitchell. Other acquaintances included Andy Warhol, who gave Farmanfarmaian a selection of illustrations in exchange for a mirror ball — the glittering object remaining on the desk of Warhol’s Madison Avenue home until his death in 1987. In 1957, Farmanfarmaian returned to her native country, learning traditional art forms including Turkoman jewellery, reverse-glass painting and coffee-house painting — a popular form of Iranian narrative art. In 1979, the Islamic Revolution would force her to leave again: Farmanfarmaian began a 26-year exile in New York, although her attachment to her distant homeland remained central to her practice. Farmanfarmaian’s mirror balls exude the glitzy pop culture the artist encountered in 1970s America, employing the reverse glass painting she learnt in Iran to cast kaleidoscopic beams of coloured light. Though far removed from New York’s disco scene, the traditions of Islamic design, with its geometric forms, continue to be an influence. Born in Ankara in 1919, Jewad Selim studied sculpture in Paris, London and Rome. His works exhibit a strong influence from 20th-century European masters including Henry Moore and Pablo Picasso. Together with the artist Shaker Hassan Al Saïd he formed the Baghdad Modern Art Group, as well as a new Baghdad School of Modern Art. After his sojourn in Europe Selim was appointed Head of Sculpture at the Institute of Fine Arts in Baghdad — a position he retained until his death in 1961. He died before completing perhaps his best-known work, the Monument to Freedom, which celebrated Iraq’s revolution in 1958 and is today located in one of the city’s main squares.